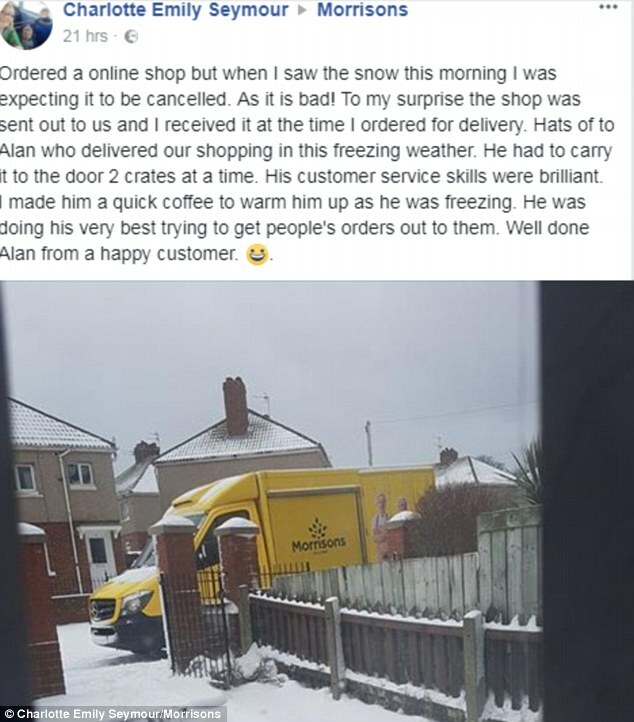 There may be snow drifts and freezing temperatures outside – but that hasn’t stopped some dedicated delivery drivers from going out of their way to make sure customers receive their online grocery shop. 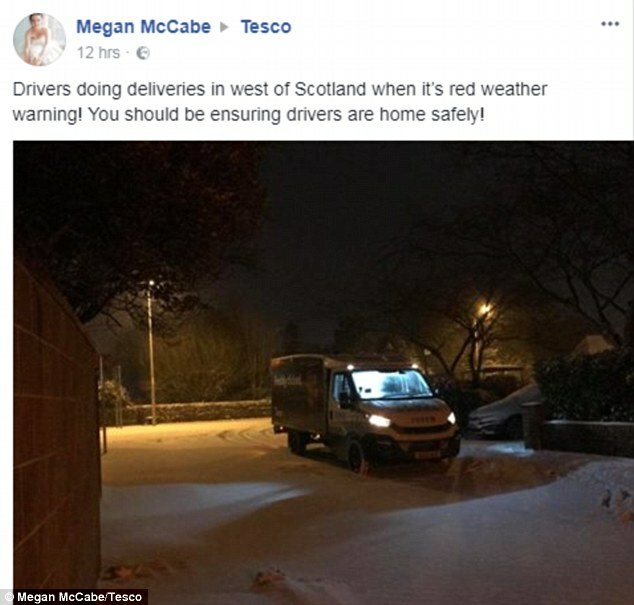 Some drivers had to abandon their vehicles and trek through the snow in order to deliver groceries to customers’ front doors, shoppers revealed on Facebook. Customers took to social media to praise their dedication this week, though some fear for their safety. 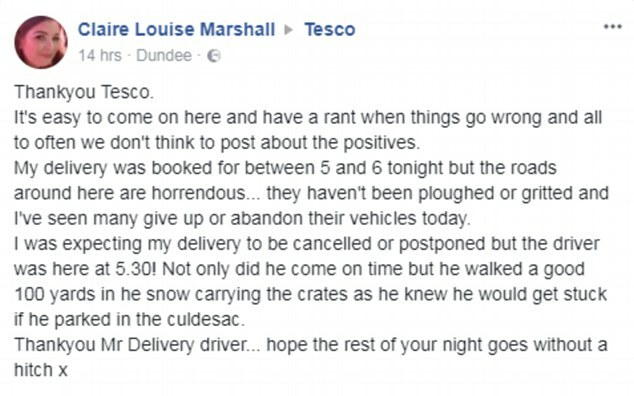 Not everyone is happy though, as the heavy snow and icy conditions inevitably led to some cancelled deliveries, which made some customers furious. The displeased customers took to social media to lash out about the lack of communication from the supermarkets about the cancellations. Some said they were only informed their delivery would be cancelled an hour into their chosen delivery slot. However the majority have applauded supermarkets for being able to make their deliveries despite the inclement weather. 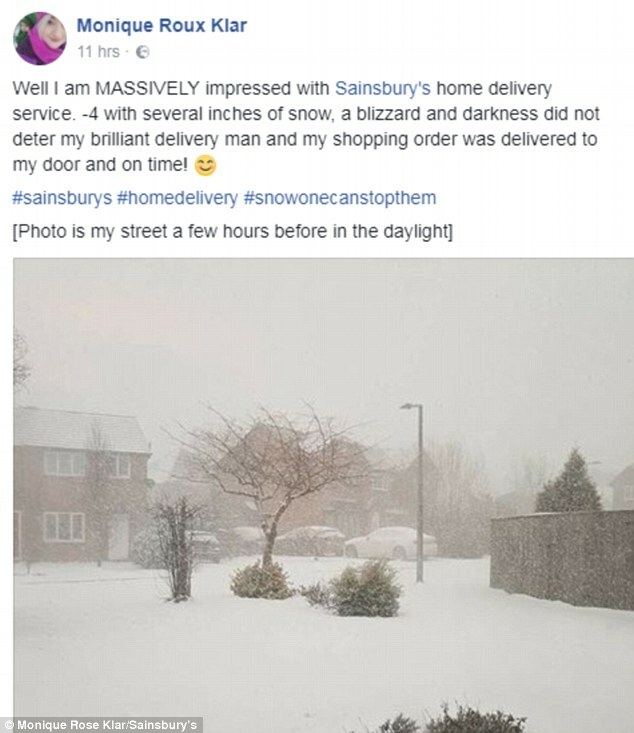 Charlotte Seymour wrote on Morrisons’ Facebook page: ‘Ordered a online shop but when I saw the snow this morning I was expecting it to be cancelled as it is bad! ‘To my surprise the shop was sent out to us and I received it at the time I ordered for delivery. Hats of to Alan who delivered our shopping in this freezing weather. He had to carry it to the door two crates at a time. 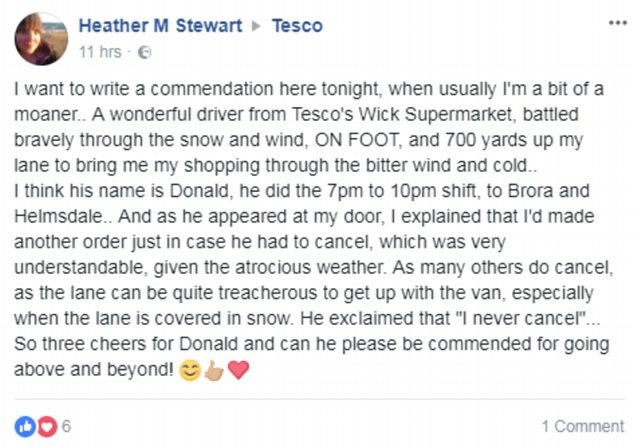 One shopper, Heather M Stewart, revealed that when her Tesco delivery driver couldn’t make it up her lane in the snow, he walked 700 yards on food through the snow and wind to reach her front door with her shopping. Several customers revealed they were so thankful for their shopping that they offered the drivers a piece of homemade cake or a warming cup of tea. 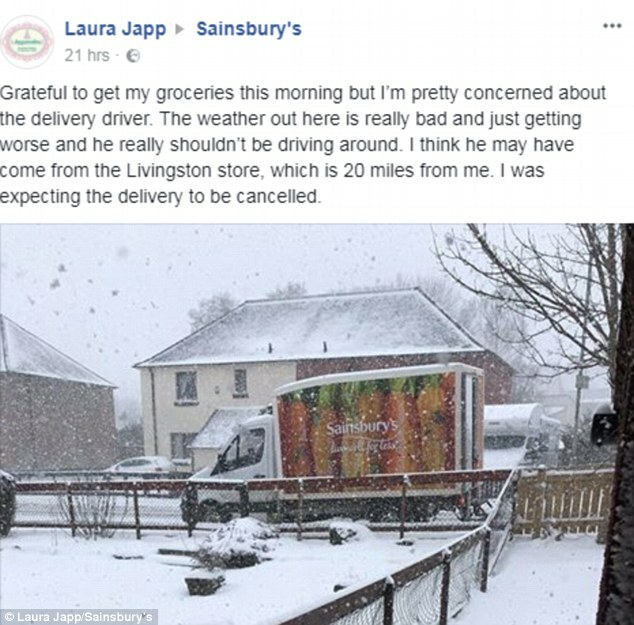 Laura Japp said she was ‘grateful’ for her Sainsbury’s shop arriving on time but did fear for the safety of delivery drivers in the snow. Not everyone was happy with the customer service from supermarkets though. Dozens also took to social media to complain about the late notification of cancellations or to write that no-one had contacted them at all to inform them that their online shop had been postponed. Some said they had been charged for the shops even though they hadn’t received any groceries. However supermarkets have been providing vouchers to give any displeased customers money off their next shop if their delivery had to be cancelled.